Pour yogurt into large strainer lined with cheesecloth or large paper coffee filter placed over container to catch liquid; cover with plastic wrap and refrigerate 6 to 7 hours or overnight. “Yogurt cheese” is left in the strainer; discard liquid in bowl. Place yogurt cheese and sugar in mixing bowl and beat until sugar granules have dissolved. Meanwhile, heat milk until hot; rub saffron into milk to dissolve. Stir in dissolved saffron and cardamom and half of nuts. 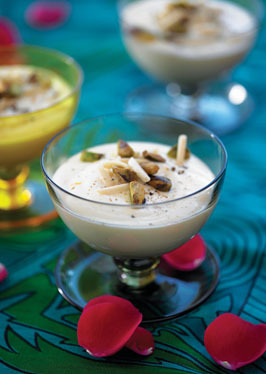 Pour mixture into glass serving bowl or individual parfait cups; top with remaining nuts.